Are the above two statements true? The two facts stated in the claim can be considered mostly true. The conclusion drawn, however, is not. Ownership rates in Switzerland are estimated between 25 and 60%. There is no official statistic and registering isn't a nationwide policy, but the responsibility of the individual cantons, which have different laws. In 2014 there were 1.25 million registered guns (800000 private guns, 455000 federally registered guns held by private citizens), which would amount to roughly 15% gun ownership, but the number of unregistered is higher (especially in the form of hunting weapons, which often do not need to be registered), which leads to those wildly different estimates. In that sense, 50% gun ownership is a high estimate, but reasonable. This point is a little exaggerated. 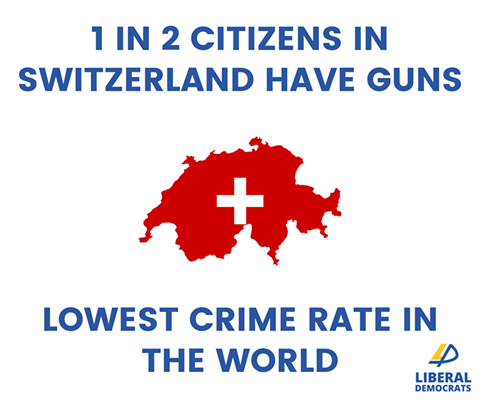 Switzerland hasn't the lowest crime rates, but it rates very well. In the most recent statistic, Switzerland is at 0.5 murders per 100000 population, which puts it at the 12th lowest homicide rate in the world. Property crime also seems fairly low, though I can't find too many statistics in that regard; Switzerland is ranked 11th out of 118 countries by Numbeo in total crime rate sorted by lowest crime rate. While the two statements are factually reasonable, the ownership assumption is in line with high estimates, the crime rate is a bit exaggerated, the claims intended conclusion of high gun ownership equals low crime is not. Gun ownership does not correlate to crime rate. Apart from the fact of the vastly different gun culture, e.g. in Switzerland it's seen as a tool to hunt or a hobby(see Factmyth source in paragraph 1 and Statements of a swiss citizen; in the US guns are mainly there to "protect" people (see many statements of pro-gun advocates in the US); the very statistics(see homicide rates link) I linked also have 2 counter examples. In the USA gun ownership is even higher at more than one gun per resident, yet homicide rate is 8 times as high as in Switzerland. While on the other end of the spectrum stands Japan with a gun ownership of a mere 6 guns per 1000 residents and a homicide rate of 0.3 per 100000. Both countries have significantly more population than Switzerland. Crime correlates much more to the economy. A stable, rich country like Switzerland is more safe, because people have no reason to go out shooting. Looking at the HDI, GDP per capita nominal and GDP per capita PPP, you'll notice the vast majority of the countries with high homicide rates are ranked very low in these economic statistics, many in the triple digits. You can draw a much more sensible correlation here than you can with gun ownership. There are two factual claims here. Let's start with the "lowest crime rate in the world". Statistically, how exactly is that claim measured? For example, do you look at everything that is illegal in one country in the world - including chewing gum in Singapore? How do you account for differences in the laws on prostitution and marijuana? How about money laundering through the Swiss banking system? How about cybercrime, or any crime that crosses borders? Since we are talking about a deadly weapon, let's look at the homicide rate (murder and manslaughter). The claim is definitely false. Singapore's homicide is roughly half to a third that of Switzerland, despite Singapore being a single mega-city, which in most parts of the world translates to higher, not lower, crime rates. Iceland's number is half of Switzerland's. Sweden's is approximately the same. Liechtenstein and Monaco take the cake - zero murders and manslaughters! Taken in the most favorable light, one could argue that in a small country such as Switzerland, Iceland or Liechtenstein, such small numbers simply have no statistical significance. But there is certainly no factual basis for an absolute statement of "lowest crime rate in the world". Source: German Wikipedia page for "Killing rate by country"
The second claim is even trickier. "One in two citizens have guns?" Almost certainly false, because only about half the population would even be eligible to own a gun (you have to be an adult, can't have a criminal record, mental illness and many non-citizens are barred from gun ownership). But what's even more important is what "to have a gun" actually means. It means that you are allowed to buy and own some guns. Hunting rifles, air guns, paintball guns etc. need to be registered. Most other guns need a "Waffenerwerbschein" (gun license) before you are allowed to obtain one (which includes not just buying, but also borrowing, inheriting, receiving as a gift etc.). Many guns that are common in the USA are plain illegal in Switzerland. But you cannot carry it outside your home. Pretty much the only thing you are allowed to do with your gun is to leave it securely stored, and take it with you on a direct route to specific shooting events (competitions, hunts etc. ), unloaded and locked in a case in your car. You can't loan it to anybody (unless that person also has a Waffenerwerbschein), you can't even inherit a gun without getting a Waffenerwerbschein. You also can't just buy ammunition. You need a Waffenerwerbschein for that, too. And the rules for retaining your weapons after military service have changed a while ago. It is still optionally possible, but no longer automatic. German Wikipedia page for "Weapon Law (Switzerland)"
As an aside, the crime rate, and also the gun ownership laws, are actually not that different between Switzerland and comparable parts of Germany. A quarter of Swiss households reported that they own a gun for army service. Few Swiss households, less than 13%, own a gun for non-military reasons. Gun advocates cite Switzerland and Israel as exemplars of nations with widespread gun ownership, permissive gun laws, and encouragement of armed civilians who can deter and thwart shootings. These claims are evaluated with analysis of the International Crime Victimization Survey data and translation of laws and original source material. Gun advocates claim that mass-casualty events are mitigated and deterred with three policies: (1) permissive gun laws, (2) widespread gun ownership, (3) encouragement of armed civilians who can intercept shooters, and cite Switzerland and Israel as exemplars. We evaluate these claims with analysis of International Crime Victimization Survey (ICVS) data and translation of laws and original source material. Swiss and Israeli laws limit firearm ownership and require permit renewal 14 times annually. ... Switzerland and Israel curtail off-duty soldiers firearm access to prevent firearm deaths. Poe called Switzerland “the most heavily armed nation on earth, per capita,” with 2 million guns. At the time of his writing, Poe was not correct: the 2002 Small Arms Survey estimated 1.2 million civilian firearms in Switzerland, or 16 per 100 residents, versus 83–97 civilian firearms per 100 residents in the US for the same period. Swiss firearm ownership increased between 2002 and 2007 Small Arms Surveys because military rifles were released to the public due to drastic army size reductions. In 2007, Switzerland had 31–60 total firearms per 100 residents, about the same as Finland, and less than the estimated 83–97 per 100 in the US and 29–81 per 100 in Yemen. ... A quarter of Swiss households reported that they own a gun for army service. Few Swiss households, less than 13%, own a gun for non-military reasons. Gun advocates claim that Swiss own guns due to tradition, but more than six times as many US households reported owning a gun because they’ve “always had one” (Figure 2). Gun advocates claim that Swiss own guns because shooting contests are the national sport, but only 5% of Swiss households reported owning guns for sport versus 12% of American households. Eight times as many American households reported owning a gun for “self-protection” as did Swiss. Switzerland’s limited gun access does not prevent gun violence. Greater firearm ownership predicts greater firearm suicide, homicide of females, and murder-suicide. Swiss gun owners are more likely than non-gun owners to report having seriously injured others. Respondents who owned a handgun or more than one gun reported more violence than respondents who owned long guns or just one gun. These findings imply that either owning a gun makes these men more violent, or that more violent men choose to own guns and Swiss law does not screen out violent men. (The DOI link is paywalled but this link gives full access to the study). Not the answer you're looking for? Browse other questions tagged criminology weapons switzerland .